Telfer and I took Cate down to the tree in Rockefeller Center on Saturday night. Lots of people. Lots of snow and wind. Lots of cold. We bundled up and were bolstered by hot apple cider. The tree is really beautiful. 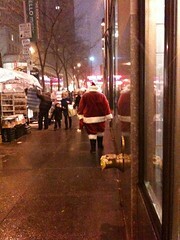 And I got this shot of a slightly dejected Santa on 49th near Rockefeller Center. Telfer's family is all here and we are in the thick of Christmas celebrations. Went to Billy Elliott last night – fabulous – Cate is loving the extra attention.